You Are Here: Home → 2013 → June → Moving to Portugal’s Survey Results! 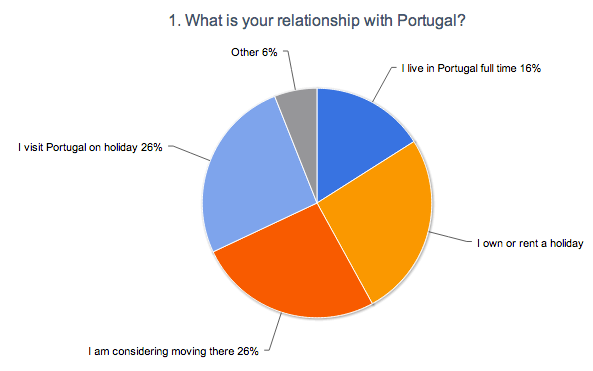 Moving to Portugal’s Survey Results! If you visit this blog regularly, you may have noticed that I recently conducted a survey of readers. You may even have participated in it, in which case, many thanks! Today, I’m going to summarize some of the things I learned from the people who kindly took the time to answer. I will also talk about how Louise and I plan to adapt the blog slightly to make sure we continue to provide content that’s of interest to all visitors – ranging from those with an interest in Portugal, via the holiday-home owners, to those who, like us, have turned Portugal into a permanent home. So, let’s start there: We learned from our survey that 26% of readers have a holiday home in Portugal, another 26% come here on holiday, and a further 26% are planning to move permanently. 16% live here full time, and 6% ticked the “other” box. We were particularly delighted to find out that many of Moving to Portugal’s readers are “regulars,” with 88% of respondents saying they have visited the site “loads of times.” Thank you for returning! In terms of content, readers enjoy practical information about Portugal the most (48%), followed by personal updates on our lives here (30%). It’s perhaps worth pointing out that I also write regular newsletters for the Overseas Guides Company, so those interested in hearing about day-to-day life here may wish to sign up for free updates there. Only 2% of people said they enjoy “political rants and controversial content,” so I guess I’ll ease off on that for now! Once we got into the freeform stuff, we were able to find out some of the topics that readers would like us to cover on the Moving to Portugal blog. The most popular of all was finding work in Portugal – and this came as no surprise as it’s the topic on which I receive the most personal emails too. As well as discussing this more in future blog posts, I’ve decided to dedicate some time to producing an eBook on the subject. Job opportunities in Portugal are very thin on the ground, especially for non-Portuguese speakers. However, both my wife and I have built up a good level of remote work from clients outside the country and with the help of the Internet. In the eBook, I will explain exactly how we did it. Hopefully, this will help people who would love to move to Portugal but see employment as the major obstacle. The new eBook will take some time to produce but I will keep you up to date. Please subscribe using the box on the right if you would like to receive email updates and don’t already. Several respondents also said that they enjoy posts about cultural differences, so I have a new post on this in the works. Stay tuned, therefore, for “five things you probably don’t know about Portugal,” which will be published at some point next week. 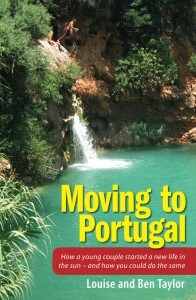 Two final things: firstly, I promised a free copy of “Moving to Portugal – the book” to one respondent. I have picked a name at random and the winner will receive an email later today. Finally, one respondent commented that repeated promotion of our book “gets tiring.” While I apologize for this, it’s not really something we can stop doing. There’s very little money in blogging for the hours we have to put into it. Every week, we deal with thousands of spam comments and constantly have to address various hacking attempts and WordPress updates – and that’s before producing any of the actual content! We also happily respond to hundreds of personal queries and emails. Sales of the book make us very little also, but do go some way to redressing the balance. So, if after reading that, you happen to feel in an altruistic mood, you’ll find a link to the book below – and Amazon are currently selling it at a discount – what’s not to like?! Readers in the US and Canada will find the book here – and it should also be available from all other country-specific Amazon sites. Hope you are having a fabulous time in Tavira and enjoying the sunshine.